WiLine's proprietary network uses 21st century fixed wireless technology for last mile delivery directly to your building. This ensures the quickest time to install, the fastest available speeds and lowest possible latency. Most businesses in Sacramento have connection speeds in the 20 Mbps to 500 Mbps range and Microwave Fixed Wireless can easily deliver those and much higher speeds with similar reliability to Fiber ISP's. A Fixed Wireless Internet solution will deliver lower latency when compared to Fiber which in turn will give you a better internet experience and higher quality VoIP communications. The availability of Business Grade Fiber Internet in Sacramento is not very widespread with only selected areas offering it. If you are not in an area served by Fiber, the costs involved in bringing Fiber to your location can amount to many thousands of dollars these will one way or another be paid by the customer. If you choose a Microwave Fixed Wireless solution, all you need is line of sight to one of our network nodes and the installation costs are much, much lower. With a phone call we can increase or decrease your bandwidth to suit your requirements. For example, you are hosting a large event at your Sacramento office with many delegates and have increased requirements for bandwidth, we can temporarily or permanently increase your bandwidth to ensure everyone is connected smoothly. This often can be achieved within minutes. This type of scalability isn't as simple with many other Internet Service Providers available in Sacramento. Since the launch of our services in Sacramento 2014, WiLine has quickly grown to become the best alternative to business fiber Internet. 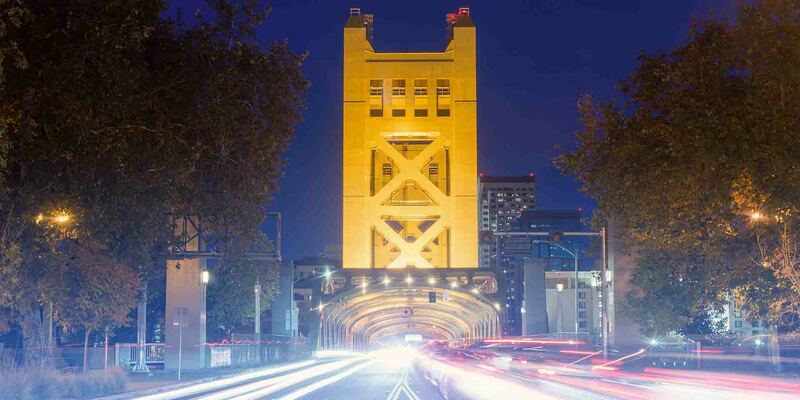 In the Sacramento metro area, WiLine Networks uses 21st century technology and a mesh network topology which offers the highest reliability of any Provider. Our Internet services offer speeds from 1 Mbps all the way up to 10 Gbps with latencies of under 10 miliseconds and a thoroughput guaranteed to be a industry leading 99.99%. We can deliver any bandwidth you require and our installation times are normally measured in hours not weeks. We are constantly upgrading and expanding our network. Why not check if your building is covered by contacting us. The cities listed above represent the wider areas where WiLine Business Internet service is available. We also cover smaller communities and business parks located outside the areas above. To find out if our services are available to your business, please Click Here.